We solve solid and structural problems using ADINA on a 80 cores / 512 GB HP server with experience exceeding 20 years. For model preparation we use Pro/E, ANSA and ADINA/AUI. 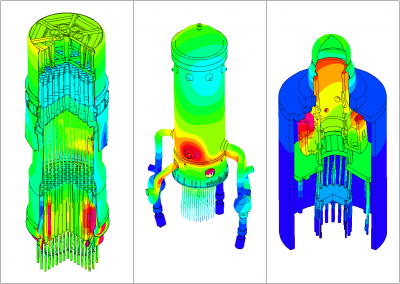 To name some examples of typical work, we analyze the structural response to transient and vibrational loadings, thermal transients and thermo-mechanical fatigue, cracks and fracture, collisions and collapse. We do analyses of various nuclear components, such as reactor pressure vessels, reactor coolant loops, piping systems, turbines and buildings. Each component individually or all components at once, as a whole assembly, in large structural verification projects for example, which may include complex non-linearity effects.